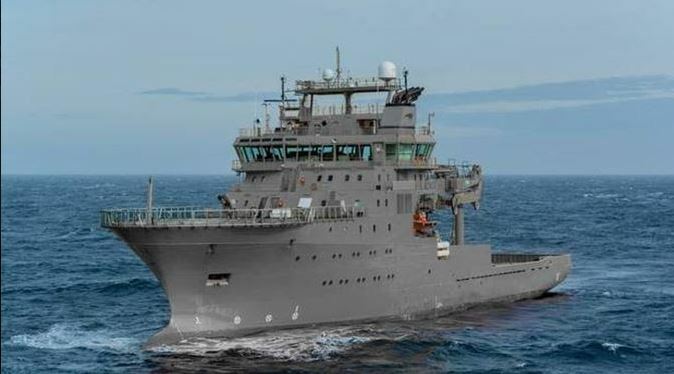 The New Zealand government has approved NZ$103 million for the purchase and refit of a second-hand multi-role offshore support vessel that will be used as a dive and hydrographic support vessel by the Royal New Zealand Navy. Following purchase, the 85-meter Norwegian-built survey vessel MV Edda Fonn will be outfitted with the dive and hydrographic systems required by the defense force. MV Edda Fonn will replace hydrographic ship HMNZS Resolution and dive support ship HMNZS Manawanui. The two vessels were decommissioned from the RNZN in 2012 and 2018 respectively, following several decades of service. “This vessel will ensure that the current capability gaps for diving and hydrography are filled as quickly as possible, with a proven, well tested platform,” says Minister of Defence Ron Mark. The ship is scheduled to be delivered to Devonport Naval Base in May 2019. It will feature a 100t salvage crane, a remotely operated vehicle and a contemporary dynamic positioning system, which will allow Navy’s specialist divers to achieve greater levels of effectiveness and safety, in a greater range of conditions. “Defence officials have subjected the Edda Fonn to considerable scrutiny ahead of purchase,” says Ron Mark. “We have been assured by independent experts that it is in excellent condition, and will handle well in the operations the Defence Force will use it for,” says Ron Mark. The vessel generally operates in the North Sea, and is under lease until the end of 2018, following which the modification process will begin. The NZ$103 million project budget is for the purchase, modifications and introduction into service. Thanks Red M for the article. The accommodation includes 41 cabins with 66 beds. This breaks down into four state cabins, 18 single berths with bathroom, 11 double cabins with separate bedroom and shared bathroom and eight double berth with bathroom. There is an on-line data room, an off-line room, six offices, a conference room, an enclosed ROV hanger / workshop and an ROV transformer room. There is also a gymnasium, sauna, sunbed, three dayrooms, duty mess, mess room and galley. Within the vessel is a 7.2m x 7.2m moonpool as well as a 1,200mm diameter mini-moonpool prepared for a multibeam echo sounder. The helicopter deck is designed for Super Puma (9.3t). The navy originally wanted a vessel that had a moon pool, centred within the ship which has direct access to the sea for operating the submersible and divers in all weathers. Does the “contemporary dynamic positioning system” cover that? Yer rite Ross , a history of second-hand-stuff alright, i.e. Black Prince, Bellona, Royaist, Achilles, Black Boats, Bathurst Minesweepers, ton Class, Tui(s), Charles Upham, Endeavour(s), Loch Class, Lachlan, Blackpool, Wellington, Monowai to name some! The politicians should purchase second-hand Bemmers as well! Pleased to read you still have your head above water! It must be the nightly beer issue medicine! The big question – white or grey. It’s currently looking very grey, guess that means fresh drop of top coat white. The last two ships that were hydrographic and diving (Manawanui and Resolution) were painted grey. The last ships painted white were Monowai, Takapu and Tarapunga. Have a look at the current photos on the link in franks input, I think you’ll find the Grey picture has been photoshopped, as the Edda Vonn is a very nice Orange and yellow colour scheme at the moment working off Portsmouth!! Sorry Nik put you crook she is at the moment the “EDDA FONN” doing a survey in the Solent.